Recently I had created an ACCDB database file in MS Access 2010 and I was working on it everyday for months. All of sudden one morning when I was trying to access this file it prompt me an error ‘Unrecognized Database Format C:\Users\Name\Documents\mydatabase.accdb’. This was the moment I really got stuck here. I tried to open Microsft Access database file again, but I got the same Error 3343 MS Access Unrecognized Database Format. In this article, I will explain you how to fix Access Database Error 3343 which I faced while accessing .accdb file in Microsoft Access version 2010. This will help you to repair Access 3343 database error. As per book online what I got that the Access database file I was accessing might get corrupted. Or it also occur when one trying to open Microsoft Access file other access version Or due to various other causes. Basically, corruption of database file is critical, but yet can easily be controlled. Let’s discuss how to get rid of this error 3343 Unrecognized ACCDB access 2013 or it may be MS Access 97/ 2000. Method 1: Open MS Access File in Other Access database version or older versions. Step1: GOTO Setting >> Files >> Options. Step3: Don’t forgot to check General >> Legacy setting is followed, as in ‘General’ format MS Access 2010 will not open it. Step4: After successful alteration open it in version MS Access 2010. Step1: Create a new database. Step3: Click ‘Browse’ >> ‘Locate’ the corrupt file >> Click Ok on the window prompt. Step4: Next Select complete database objects to import and click on OK.
After working on this if MS Access Database Error 3343 unrecognized database format in MS Access continues, try below Method. Method 3: Compact and Repair Inbuilt Utility. Step 1: GoTo Tools >>Database Utilities >>Compact and Repair. Step 2: Save the recovered database to a new location. Method 4: With Access Database Recovery Tool. 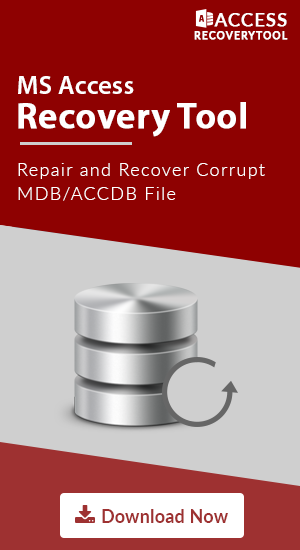 Complete Access Database Recovery Solution: The tool completely scans and repairs corrupt MDB files as well as corrupt ACCDB files of the damaged MS Access database. Retrieve Linked Tables Data: Utility can easily recover data of the corrupt or damaged linked tables of another database. Previews Recovered data: It enables user to veiw the scanned objects by offering preview of each of the recovered data within the main interface. File Structure: Original database file structure and relationship structure of data is maintaind after the recovery proccess completes. Supports: Compatible with Microsoft Access database version 97/2000/2002/2003/2007/2010/2013/2016. Also, It can be installed on Windows 10/8.1/8/7 and other older version windows operating system. Above we have discussed How to Fix MS Access Error 3343: Unrecognized Database Format error in detail. Also, a safe and secure way to repair MS Access error 3343 is discussed with the manual solution. So, before going to any repairing firm spending lot of money try fix it by yourself.